Waterfalls have always had a special appeal, as does water in generala lake, a river, the ocean, a babbling brook. Just how many waterfalls in San Gabriel Mountains, only God knows. John Robinson speaks of "two dozen or so real waterfalls." Tom Chester and colleagues list 65. And I have found waterfalls that don't even make his list. And adventure hiker Chris Brennen has rappelled down falls that may have never been previously touched by a human. The chart below lists the more popular and accessible falls in the San Gabriels. The hike numbers in the left column are from John Robinson's Trails of the Angeles (Eighth Edition, April 2005). (The hike numbers in parentheses indicate that the waterfalls are mentioned in the hike description but are not the primary destinations.) Of the 15 trips, I've hiked all of them and have write-ups for 14, which are linked from the chart. I hiked to Switzer Falls in April 1996 and am eager to rehike it to write it up; the area was incinerated by the 2009 Station Fire. 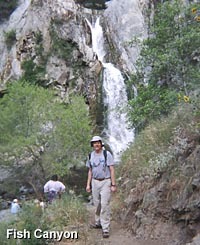 John Robinson begins his write-up for Millard Canyon Falls by stating: "Of the two dozen or so real waterfalls in the San Gabriel Mountains, only four are readily accessible to the leisurely stroller. Millard Canyon is one of these." He doesn't specifically name the other three. So I had the opportunity to ask him about it. He said that the other three he probably had in mind were Switzer, Rubio, and Fish. And then he added Sturdevant and San Antonio. Then I asked about Lewis, Eaton, and Monrovia. To that he replied, "Well, I guess there are more than four." Robinson features 11 waterfalls in his 100 Trails, all of which are pretty easy to get to (12.6 miles of the trip to Glen Canyon Falls are on a paved road which can be done easily on a bike). The chart above shows these trails plus several more popular falls. Jerry Schad features 13 waterfalls hikes, all of which I've included on the chart except for the Upper and Lower Devils Canyon trips. These two adventures are quite arduous. He does not mention Glen Canyon Falls. John McKinney features 11 waterfalls hikes, all of which I've included on the chart. The ones he does not include are Cooper Canyon Falls, Glen Canyon Falls, and Lewis Falls. Just a half mile up the stream from Millard Canyon Falls, these impressive multi-tier, 70-foot waterfalls are easily seen (in fact, hard to miss) from a distance from the Sunset Ridge Trail and fire road, but getting to them is not so easy. The primitive 100-yard path from the main Millard Canyon stream bed is precarious and inundated with poison oak. Read more in my Millard Canyon Falls hike description. I've never seen these falls mentioned anywhere, except for a now-missing wooden sign along the trail to Fish Canyon Falls. The sign had been located on a tributary coming in from the west. The times I had seen it I mistakenly assumed it was humorously referring to the little trickle tumbling over some rocks there. Finally, being tipped off by a hiker friend, I ventured up the stream 75 yards to find a darling 15-foot falls pouring into a shallow pool. Read more on my Fish Canyon Falls hike description. Christopher Brennen has probably forged his way down every noteworthy canyon in the San Gabriels. In route he has visited numerous waterfalls that are only accessible to those who have training, skills, and equipment for the task. Many of these falls are not officially named and do not show up on lists, maps, or in the literature. 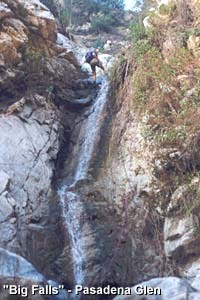 Some of the treks are in canyons with waterfalls which are easily accessible on the lower ends, such as Bailey Canyon and Eaton Canyon, but which have other remarkable waterfalls remotely tucked away up canyon. He has documented various of these exploits on his website: Adventure Hiking and Canyoneering in the San Gabriels. As I have combed through the books, it's possible, in fact probable, that I have missed a waterfall or two mentioned by the authors. If you find inaccuracies, please email me the corrections. In the case of waterfall heights and hike mileage, there are often discrepancies between authors. I've endeavored to present the number that I've ascertained as having the highest likelihood of accuracy. For mileage, I tend to lean toward Schad over Robinson. I would appreciate any input you may have. Contact Dan Simpson. SGM: The Waterfalls - by Tom Chester, Jane Strong, and Paul Ayers. An extensive amount of information, including a list of 65 waterfalls in the San Gabriel Mountains, the most extensive list I have seen. Adventure Hikes and Canvoneering in the San Gabriels - by Christopher E. Brennen. Provides thorough information on numerious cross-country hikes in the San Gabriel Mountains. Includes complete trip descriptions, equipment lists, topo maps, and photos. Trails of the Angeles: 100 Hikes in the San Gabriels - by John Robinson with Doug Christiansen (Wilderness Press, Eighth Edition, April 2005). Features hike descriptions for 100 hikes in the San Gabriels, 11 visit waterfalls. Bailey Canyon was added in the Eighth Edition. Afoot and Afield in Los Angeles County - by Jerry Schad (Wilderness Press, Second Edition, Sept. 2000). Features hike description for more than 100 hikes in the San Gabriels, 13 visit waterfalls. Los Angeles County: A Day Hiker's Guide - by John McKinney (The Trailmaster, 2006). Features hike descriptions for 46 hikes in the San Gabriels, 11 visit waterfalls. California Waterfalls - by Ann Marie Brown (Foghorn Press, 1997). A guide to 200 waterfalls in California. She writes up 14 waterfalls in the San Gabriels. California Waterfalls - by Chris Shaffer (Shafdog Publications). 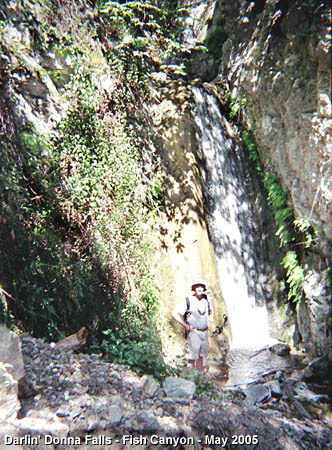 He covers 265 waterfalls in Calfifornia, including 25 in Angeles National Forest/LA basin, including all the falls in the chart above except Glen and Fish. Note: I have not yet acquired this book (nor have my closest two public libraries), so I cannot give any firsthand endorsements. I did briefly thumb through a copy at the Forest Service office in Glendora. Has lots of color photos and seems to be nicely done. This page was last updated March 20, 2017 - Spring Equinox.